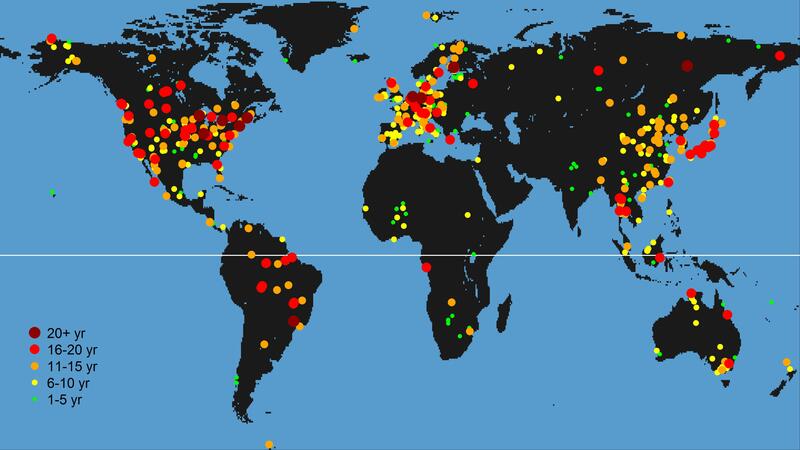 FLUXNET, the global network of eddy covariance flux towers, provides the largest synthesized data set of CO2, H2O, and energy fluxes. To achieve the ultimate goal of providing flux information “everywhere and all of the time,” studies have attempted to address the representativeness issue, i.e., whether measurements taken in a set of given locations and measurement periods can be extrapolated to a space- and time-explicit extent (e.g., terrestrial globe, 1982–2013 climatological baseline). This study focuses on the temporal representativeness of FLUXNET and tests whether site-specific measurement periods are sufficient to capture the natural variability of climatological and biological conditions. FLUXNET is unevenly representative across sites in terms of the measurement lengths and potentials of extrapolation in time. Similarity of driver conditions among years generally enables the extrapolation of flux information beyond measurement periods. Yet such extrapolation potentials are further constrained by site-specific variability of driver conditions. Several driver variables such as air temperature, diurnal temperature range, potential evapotranspiration, and normalized difference vegetation index had detectable trends and/or breakpoints within the baseline period, and flux measurements generally covered similar and biased conditions in those drivers. About 38% and 60% of FLUXNET sites adequately sampled the mean conditions and interannual variability of all driver conditions, respectively. For long-record sites (≥15 years) the percentages increased to 59% and 69%, respectively. However, the justification of temporal representativeness should not rely solely on the lengths of measurements. Whenever possible, site-specific consideration (e.g., trend, breakpoint, and interannual variability in drivers) should be taken into account.